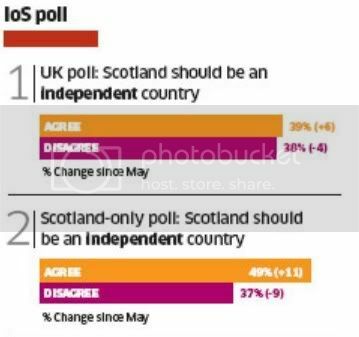 A poll by ComRes for the Independent on Sunday and Sunday Mirror has some interesting findings on Scottish Independence. The headline figures are that people in the UK as a whole agree that Scotland should become independent by a margin of 39% to 38%, with the margin in Scotland rising to 49% to 37%. That's encouraging, even though the Scottish sample size is quite small. Obviously we'd expect a high degree of agreement from the SNP, Plaid Cymru and the Greens, but the figures for the three main unionist parties are quite surprising. Labour and LibDem supporters in the UK as a whole are almost equally divided for and against Scottish independence; and the same percentage of Tory supporters agrees with them, although the margin against is greater because fewer are undecided. This might well explain why the leaders of the three unionist parties are finding it so difficult to put together a case for maintaining the UK. If their own supporters are divided half-and-half on this issue, how can we expect them to be anything other than half-hearted in trying to defend it? Why fight for something even your own supporters don't really want? I think for the Unionists it's quite a hard argument to fight against. I think what most want to say is "You wouldn't survive being independent.... poor economy, social sec problems etc". However when people say that it makes the other angry thus if D.C said that, I'm sure the Scots would say "hell, yes we could". So a positive campaign is the best. But frankly there aren't many positives for it that I can think of. Areas of Scot are very poor and unhealthy. The only argument is a strong military- but do we seriously think Norway would invade the day Scot becomes independent. So I really feel for the Unionists- the best arguments they have, are to be a negative campaign. However these campaigns don't tend to go down well. In contrast the Nationalist have quite an easy argument with positive visions for the nation. They don't really need to have any negative campaigning. Furthermore... you have the argument that some from Labour won't campaign alongside the Tories- this looks terrible. So far, the argument FOR independence hasn't yet been put in Scotland. The absurdity and disarray of the unionists is entirely responsible for this trend. Salmond will be sitting back with his Cheshire cat grin, watching the unionists do all his work for him. And good for him! You say that one argument for staying in the UK is a strong military, Anon. I don't see it that way. I imagine that Scotland would remain part of NATO, and therefore will be as secure from invasion as would be the case with either Iceland, Norway or Denmark, which are all members. After independence, Scotland will be entitled to its fair share of the UK's current defence resources, and there is no reason why it shouldn't maintain its current army, navy and air force ... and even use the money it saves by not needing to pay for its current share of the UK's nuclear deterrent on making them more effective than they are as part of the UK. As a member of NATO, Scotland will also be just as able to play its part in overseas operations, though it will be able to judge for itself which ones. I think it's almost certain that there won't be a united No campaign, simply because any campaign that includes the Tories will be counterproductive and encourage others to vote Yes. Probably the LibDems too. So Labour must take the lead, and they're probably holding back until they elect their very first Scottish leader. But it's not really about personality. Labour have got to define an alternative to independence; and must also be able to deliver it, because a federal, or more federal, UK requires the agreement of the remainder of the UK. It could only be delivered if they were in power at Westminster ... they're not, and the referendum will be held before May 2015 anyway. So it really is looking bleak for the union. Thought you might like this quote below, MH. "Douglas (Alexander) when trotting out the line that he is more interested in ‘abolishing poverty than abolishing Britain’, sounds like one of those many Alexander-Gordon Brown pamphlets, eulogising the union of ‘social justice, not separatism’. In one of the most unequal countries in the rich world!" Labour in Scotland have left it very late when it comes to developing a coherent message. Maybe too late. "Why fight for something even your own supporters don't really want?" The voters may not want it but the banking and armament lobbies do, and ultimately that's what's really matters to them.